b) they may actually mess up the newly expanded database tables. or 3) Add the new module names to the menu structure, and try to figure out a way to remove the original module names from the menu structure (and add them back if the new module is ever removed). I have seen examples of how to add a menu item, but not how to remove a stock one (without editing the 'core' menu definition files (I suppose I could just replace the stock menu definition files, and put the original ones back if uninstalling. But, that could mess up someone that had already hand edited their menu definitions)). Can someone point me toward a Best Practice way to do this? Let's say that I want to add additional fields to the 'countries' table. And, to be able to administer these new fields, I will want to make changes to /admin/countries.php (a core file). To change this file, I could overwrite the stock /admin/countries.php file. Not the best choice, in my opinion. Even in Frozen, the stock ADMIN menus are still hard coded (in this case, the link to /admin/countries.php is in /admin/includes/boxes/localization.php). So, instead of overwriting /admin/countries.php, let's say that I call my new admin file something like /admin/new_countries.php. I can add a link to my new file to the menu (I have seen how to add a new menu item to the array), but the stock link to the stock /admin/countries.php file would still be in the menu. I'm concerned that a shop owner (or some hired help) might use the stock /admin/countries.php link and file, and possibly mess up the database table. I could overwrite the /admin/includes/boxes/localization.php file, but there's the chance that the store owner has already made their own changes to /admin/includes/boxes/localization.php, so overwriting it would also not be a good choice. What I originally asked was ... is there a way THROUGH THE ADD-ON INSTALLATION process, to be able to remove (or hide) a link in /admin/includes/boxes/localization.php menu file, and be able to add it back (or un-hide it) if the add-on is ever uninstalled? 2) copy my new /admin/countries.php file into its place. This way, no changes to the menu structure have to be made. And, if the store owner ever chooses to uninstall the add-on, the new /admin/countries.php file would be deleted, and the renamed /admin/countries.old file would be renamed back to /admin/countries.php. but there's the chance that the store owner has already made their own changes to /admin/includes/boxes/localization.php, so overwriting it would also not be a good choice. They shouldn't have...if any addon requires shopowner to *manually* add code to a sidebox...the addon is outdated. I think this system was introduced in 2.3.3 (or so), the ability to add links without amending files. Thought about this a bit more. 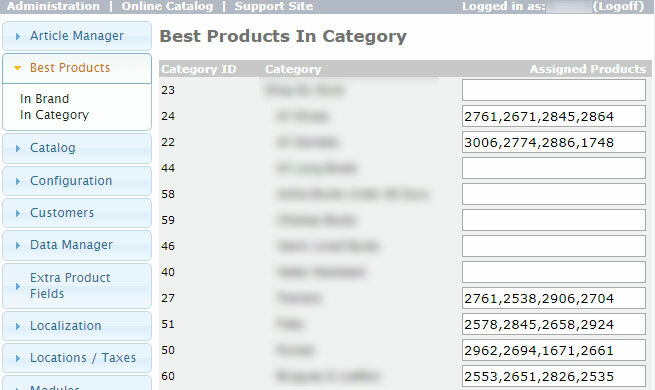 I recently made for a client a system of assigning "best" products in a category and manufactuer/brand. This is what I was asking about ... if this was even possible. Way above my pay-grade, though. I had considered creating a new table instead of adding additional fields to the existing Countries table, but thought it would require more work than it was worth. I may have to reconsider that. But, since Admin is not modularized, there is no built-in way to install any new modules. The store owner would have to manually copy files, run something like phpMyAdmin to work on the database tables, etc. Definitely not a copy/one-click install/configure/go type of thing. So, maybe this isn't something that really is suitable as an add-on. At least, not one that tries to conform to proper coding practices. This is what I was asking about ... if this was even possible. For sure possible. Shopowner would then need that couple of lines of code to call the Hook. If you could post what it is that you're exactly wanting to do with the countries...I could take a think and provide some thoughts.